Whether you choose to turn in your aluminum cans yourself or just let the local municipality collect them, the home composter is doing a valuable service for his community -- both local and global. Recycling of cans, newspaper and plastic containers helps to reduce the need for ever increasing amounts of landfill space. The same is true of composting and the homeowner also gets a bonus - free, high-quality fertilizer. A home recycling center is a relatively simple project to construct - it's really just a simple lean-to - if you remember a few simple points. First, place the recycling center in a relatively unused and unseen part of your yard. It can be unsightly and definitely creates an aroma during the summer months. Secondly, be sure to use pressure treated wood so that the project lasts more than a season or two. Actual construction begins by installing a number of 2x4s at the appropriate height along the side of your home or garage. These will anchor the back of the shelves and secure the entire structure. Posts constructed of 4x4s are anchored for the front of the structure. Exterior plywood is used for the sheathing on the sides, the roof and the shelves. Shelves should only be installed on one side of the center - the other side will hold the larger composting bins. Finally, add some standard roofing materials - tar paper and shingles - to protect the structure from precipitation. It is also a good idea to finish the edges with trim to avoid moisture entering the ends of the wood and to minimize the effects of any sharp corners. Building a compost bin is only half the battle. Now, you have to use it and that means establishing a convenient recycling process. In addition to the cans and containers outside, set up ones inside the home for fast and easy use. The container for the compost material should be covered to contain odors but easily accessed or it just will not be used. The average kitchen produces almost 200 pounds of organic waste every year. Much of it can go into the compost pile. Add apple cores, melon rinds, vegetable peelings and eggshells. Avoid adding meat and dairy products as they attract pests larger than insects. In addition, the ashes from your fireplace can be added but in moderation. Finally, don't forget to add grass clippings, leaves, and other garden refuse to the outside container. 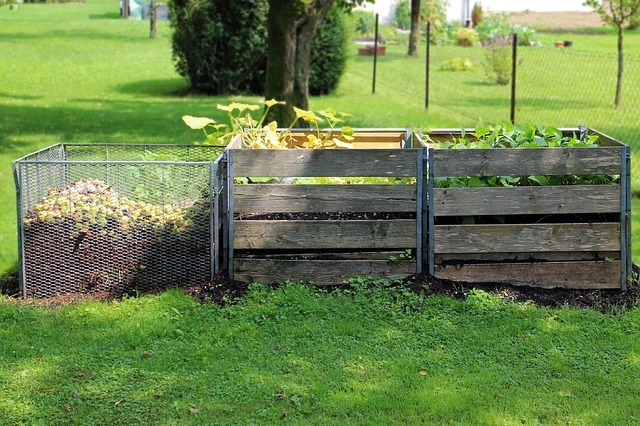 When building a compost bin, it is important to understand that it creates an "attractive nuisance" for you and the creatures that live around your home. The outside bins should be securely capped and the compost pile itself protected by chicken wire. This will keep vermin and other larger animals from making a mess. The inside bins will most likely attract fruit flies and ants but these are more an annoyance than a real problem. Finally, keeping the interior bins near the front of the garage by the door will help minimize the accumulation of any noisome odors. Good luck and happy recycling!